This past week, I’m hoping that you didn’t need to see bomber jets flying or hear gunshots in the street to help you actively remember that we are living in a big and important story, where our decisions as crucial as those made during a war. In the first post of this new series, the challenge from last week to be aware was just the first step of our journey in Waking Up to The Good vs. Evil Plot. If you are like me, you want to rise out of the everyday humdrum of life, to live for something meaningful and fight for something great. You might not consider yourself an advocate, let alone an activist! But that doesn’t mean there isn’t a part of you that craves to make a difference. I typically go to church to be inspired and challenged by others who are on the same road as I am. Recently the pastor, Rob, has been going over Matthew 9-10 in the Bible. In this passage, Jesus was giving instructions to those he was sending out as workers to make a difference in the world. This passage struck me as applicable, because we too are motivated to be world changers. Although Jesus’s ultimate mission wasn’t advocacy work, he was driven by a compassion advocates on all side of the religious spectrum would do well to imitate. But even though Jesus was bursting with compassion, in this passage Jesus’s wasn’t sugared or light on calories like Sweet and Low. He was dishing out the thick meat, a firm commanding officer prepping his soldiers. You can see he loves those soldiers, but you also know he is reminding them what serving looks like–it’s no easy game they are playing at; it is a war of good vs. evil. In fact, Jesus’ instructions sound a lot like the classic pep-talk that begins all valiant and dangerous stories. The ones in which casualties are a guarantee. In this case, he was calling his platoon to give up everything they held dear and stick out their necks for the seriousness of their mission. He said they should actively care for people’s felt needs. He told them not to worry about their own needs. He said people would hate them. He also said that they had to be willing to die. That their loved-ones might hate them for their allegiance. I couldn’t help noticing the way Jesus was talking indicated he was fully engaged in the good vs. evil plot-line I was discussing here. Regardless of whether you think the account of Jesus is just a myth, or if like me, you believe it is the power of life itself, I thought his story was worth honing in on. There is something to be learned from any historical figure who drastically changed the world. So how did Jesus fully engage himself in this plot-line? In a way, it is almost easier to start with the flip-side of why we don’t engage in this story, and then look at how Jesus responded to the hindrances we struggle with. What holds back any soldiers in a war? What hinders Christians from engaging in their call to pass on their message? Not surprisingly, it is the same thing that holds us good ol’ folk, us average advocates, from engaging in the good vs. evil story. First, we don’t have an eternal perspective. We are focused in on our little lives, not us in the broader context of humanity and time (or what is outside of time as we know it). Like I discussed in last week’s post, we don’t believe there is a war, a bigger story. Secondly, we don’t see the difference choosing to be involved can make. We are either ignorant and unaware of our potential influence, or we simply don’t believe we have anything meaningful to offer. I’ve heard professors with PHDs in world-change (that isn’t exactly what they call it) and directors of massive global organizations (like Richard Stearns in The Hole In Our Gospel) agree with Rob on these two points. I’ve seen them played true in my life as well. Impressively, Jesus got around these issues. He counteracted these hindrances by first embracing humility and then by believing in his value–he knew he would make a difference and lived accordingly. I spent a lot of time hashing through these two remedies in-depth–embracing humility, and believing in your own worth–hoping to grasp how we can replicate them as world changers. I don’t want you to miss out on the value of continuing to process together how Jesus, a world changer, lived these out! Please be sure to follow Average Advocate via newsletter (optin below), Twitter, or Facebook so you don’t miss the next posts in the continuation of the series, The Good vs. Evil Plot. Let’s continue to explore Jesus’ narrative as an example as we perfect the art of being an advocate. Do any of Jesus’ instructions to his followers seem too hard to you? What mission do you believe in enough to follow such self-sacrificing undertakings? Do you agree with Rob’s assessment of what hinders us from jumping in to make a difference? Why or why not? What characteristics of Jesus (and other world changers) helped them overcome the natural tendency to be unaware of the good vs. evil war around us? 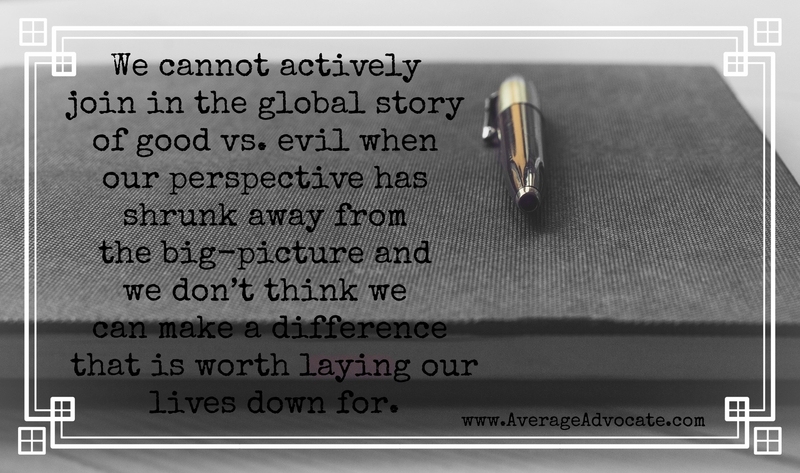 We cannot actively join in the global story of good vs. evil when our perspective has shrunk away from the big-picture, or we don’t think we can make a difference that is worth laying our lives down for.